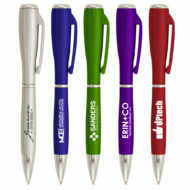 Make sure your company lights up the room when you come in with the custom printed Nova LED Light Metallic Pen! 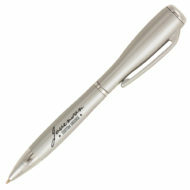 This multi-function pen features a button-activated LED flashlight at the top. Black ink comes with the medium ballpoint pen. The LED light makes writing a fun little show for any recipient. 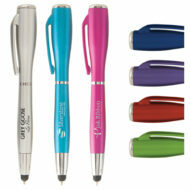 Use this writing instrument at trade shows, conferences, conventions and other corporate events. Imprinted with your company name, logo and advertising message to increase your brand’s reach. Get in on the act every time clients pick up the pen to enlighten others about their thoughts!